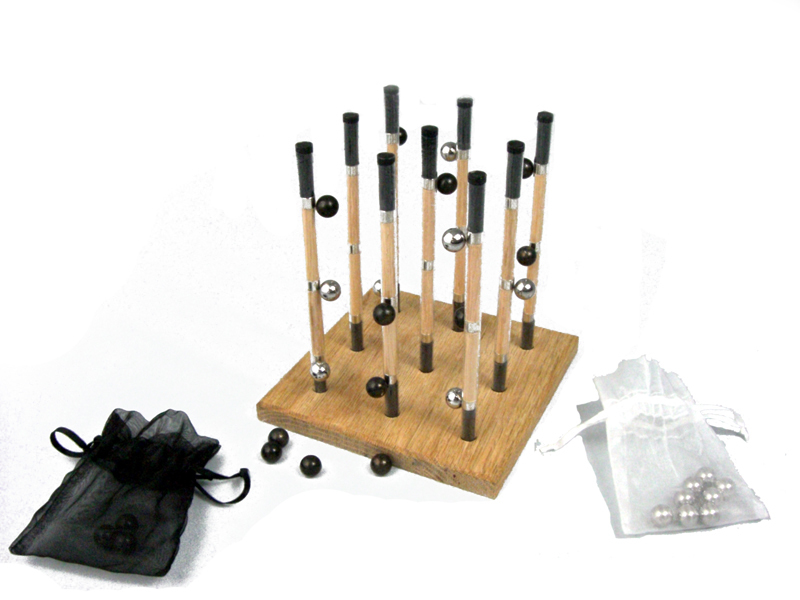 A game of magnetic 3-D strategy. As an elegant 3-dimensional strategy game, its tabletop beauty is rivaled only by the intricacies of its game play. Players witness quality steel playing peices hovering above the table in this battle of spatial awareness. Based on a well known fundamental concept, the game, designed for 1 or 2 players, is quick to pick up but completely captivating and challenging to master. This product has been evaluated and very well received by ages 8 through 85. A small pre-production quantity has been created for evaluation and sold very quickly to excited consumers. Tested on and enjoyed by consumers ages 8-85. This game would make a good desktop or office conversation piece for the professional and executive demographic. This game would make a good coffee table game / conversation piece for the family / gift-giving demographic. Typically played by 2 people, also provides single player puzzle games. Kids and young adults love it, This product is a great tool for training future technical minds by understanding 3-D structural relationships and patterns. Easy to understand, but challenging to play. Very small learning curve, anyone can pick up this concept in a few minutes with brief description. The abstract construction of the game provides a good challenge that requires concentration and deliberation. 3-D contemplation for developing minds is a great way to improve spatial relations. Offers a great way for seniors to keep their mind sharp. Eye-catching for guests in the home environment. Eye-catching for clients / co-workers in the office environment. An addictive 5-10 minute game that can be played many times over. An aesthetically pleasing and eye-catching conversation piece. Oak base and solid steel balls give the product a feeling of quality. Several modes of play in one product.